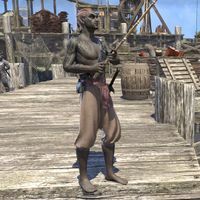 Brothes is a Dunmer sailor who can be found in Vivec City. He wanders the docks near the Gladiator's Quarters and occasionally fishes. He cannot be talked to. This page was last modified on 23 April 2018, at 08:53.